The Sarasota County Commission this week asked its staff to come back in June with more detailed breakdowns of costs for a new South County courthouse and renovations to the R.L. Anderson Administration Center in Venice — including the potential of surtax revenue and other sources of money to help pay for the projects without having to hold a public referendum. The board also voted unanimously on May 18 to have staff stop its planning for a November referendum to pay for new facilities Sheriff Tom Knight has said for years his department desperately needs, but to continue preparations for a potential referendum in 2018. “In two years, the sheriff’s needs will be even greater than they are right now,” Commissioner Charles Hines pointed out. In a May 6 letter to the County Commission, Knight withdrew his support for the referendum this year. He told The Sarasota News Leader last week that he was concerned about the timing of the ballot measure, given what portends to be a highly negative presidential campaign season after the Republican and Democratic national conventions this summer, plus the possibility that the City of Venice will have two referenda on the ballot — for road projects and a new public safety facility — and even the potential for a county measure that would allocate a portion of Tourist Development Tax revenue to a South County stadium for the Atlanta Braves. Moreover, Knight pointed out, he had asked county staff for two years to provide him with materials to make the case to the public for the need for his department’s new facilities, with no response. 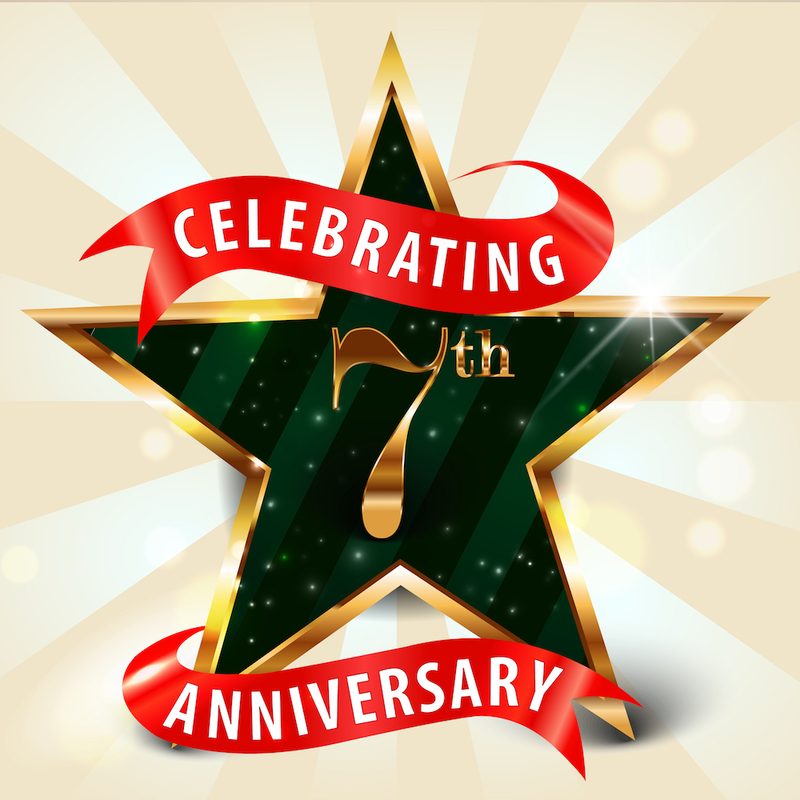 A “save-the-date” card was released in March, Assistant County Administrator and Chief Financial Officer Botelho noted on May 18 and in a response to the News Leader last week. During slightly more than an hour of discussion about the projects originally proposed for a referendum this year, commissioners raised concerns about comments conveyed to them by residents regarding the construction cost per square foot for the two South County projects, which is slightly more than $680. Staff explained that about $8.8 million in impact fee revenue could be used to defray the expense. Moreover, Hines continued, “A lot of people in this community never ever go into a courthouse.” They would look at the $36 million estimate, he added, and recall critical stories about a $48.8-million courthouse that was built in Tallahassee several years ago. 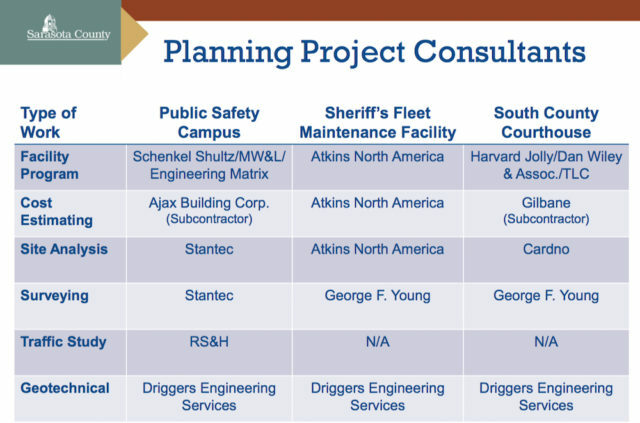 Yet, as Commissioner Christine Robinson pointed out, the South County courthouse facilities have been in the formal planning stages since 2009, prior to her 2010 appointment to the board to fill the unexpired term of Commissioner Shannon Staub. Robinson added that the courthouse project originally was on the list to be paid for by revenue from an extra 1-cent tax voters approved in 2007; it later was removed. Other commissioners concurred that, with the growing population in South County, the new facilities are needed badly. “People don’t want their taxes raised,” Hines told staff, “but this community will support these types of referendums” if legitimate need can be demonstrated. Botelho then asked about proceeding with a November referendum for the remaining two projects on which staff has been focused: a Public Safety Campus proposed for the Sheriff’s Office on Cattlemen Road — estimated at $107.8 million — and a new fleet maintenance facility for the Sheriff’s Office on Laurel Road — projected to cost $20.9 million. Hines told Botelho, “If the gentleman that needs [the facilities] says, ‘I’m not willing to support [a referendum] at this point,’ who are we to tell him — I know you had to ask the question, but, come on!” Hines added that he had not received a later letter indicating Knight had changed his mind. “I agree with that,” Maio said, “but I would just like to suggest very strongly to staff” to go ahead with the necessary steps to rezone the parcels at the intersection of Cattlemen Road and Honore Avenue where the Public Safety Campus has been planned, so the property could be used by the Sheriff’s Office. Robinson also noted that representatives of construction firms in the community have offered to look at the costs for all the proposed projects. “You may want to consider reaching out to [those] who are willing to do that,” she told Brad Gaubatz, the Capital Projects Division manager for the county who supervised the consultants and subcontractors who derived the figures the commission reviewed on May 18. “Obviously, we would be happy to,” Gaubatz replied. In his remarks at the outset of the discussion, Botelho said staff research had found that the commission first discussed the Sheriff’s Office’s facilities needs in 2011. While the board discussed those and the South County projects in detail during its March 2015 budget workshop, he noted, the referendum list continued to evolve over the past year. 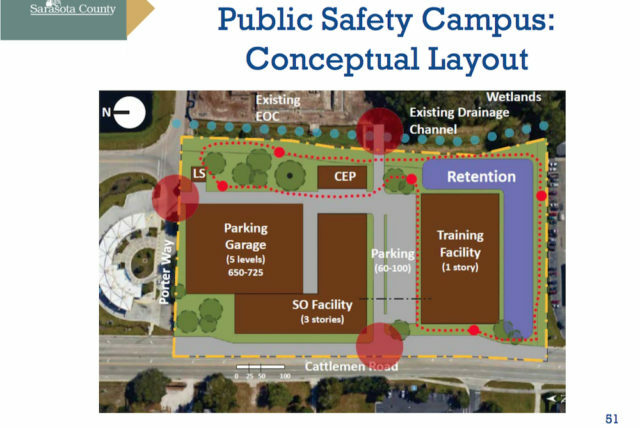 Among the most recent decisions, he said, were the removal from the Public Safety Campus a facility for both the Medical Examiner’s Office and the Sheriff’s Office’s Forensics Lab. That resulted from the Manatee County Commission’s assertion that it was not ready to enter into an agreement over the Medical Examiner’s Office, which serves Sarasota, Manatee and DeSoto counties. The primary reason the board and staff had been working on a referendum, Botelho continued, is because the Sarasota County Charter requires that voters approve any borrowing of $22.5 million or more. With the total referendum costs estimated at $176.2 million — or $163.7, with the impact fee revenue subtracted — the only way the county could afford the projects was to proceed with a referendum. 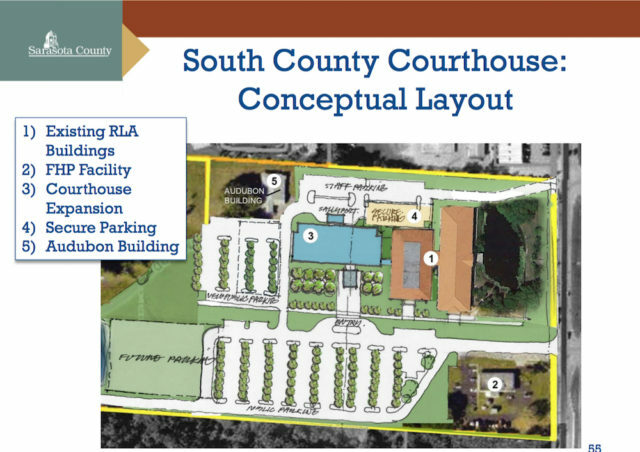 After Gaubatz began discussing the plans for the South County improvements, Vice Chair Paul Caragiulo was the first to raise questions about the cost per square foot for the courthouse. Gaubatz had talked about the plans for six new courtrooms, with the potential for expansion to eight, and renovations of the county’s constitutional officers’ facilities in the R.L. Anderson Center (those of the Supervisor of Elections, for example), along with other county offices. Gaubatz explained details of the process staff and its consultants used to reach the figures. 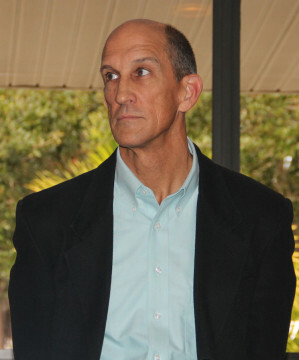 He added that staff also had held meetings with all the stakeholders — the State Attorney’s and Public Defender’s offices, the Sarasota County Clerk of Court, the courts administrator for the 12th Judicial Circuit, the Sheriff’s Office, the Sarasota County Bar Association and judges — in preparation for the basic design they needed. The estimate per square foot for the “hard” construction was about $333, Gaubatz pointed out. That did not include site work and contingencies, for example, that had to be added in to arrive at the total estimate. When Caragiulo pointed out that someone had provided him information about a new courthouse that was built in Bay County at a cost of $12 million for 60,000 square feet, Gaubatz replied that staff researched that project and learned the “hard” construction expense was $284 per square foot. 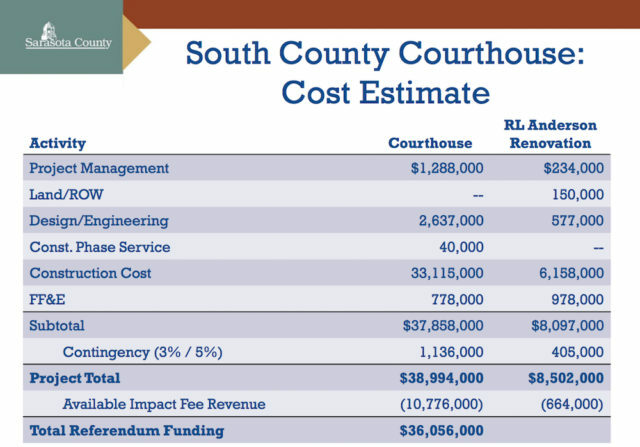 In response to a question from Chair Maio, Gaubatz noted that the South County figure included a 4-percent “escalation,” with the expectation that construction costs will be higher by the time the project is put out for bid. Indications are that the expense could be 6 percent higher in two years, Gaubatz added. 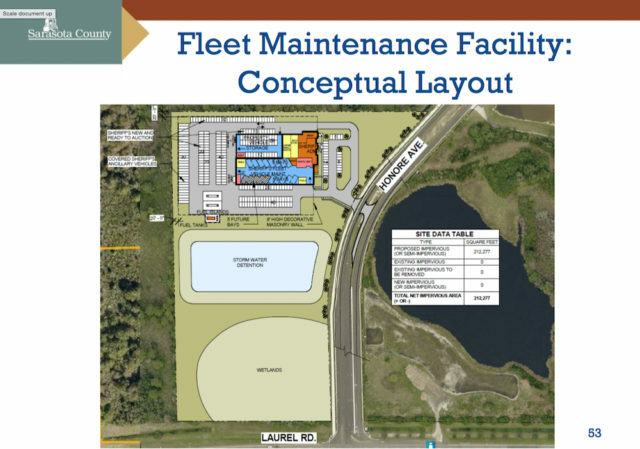 If the cost could be reduced to $350 per square foot, Hines pointed out, the county might be able to pay for the facilities in South County without having to seek a referendum. Botelho suggested that if the board chose to adjust its five-year capital project plan to carve out funding for the South County Courthouse and R.L. Anderson renovations, that could delay other construction that already has been promised to the public. “We have to take the heat for that if we jostle this or change it, based upon what the community needs versus what it needed when [the Surtax 3 measure] passed [in 2007], Hines replied. After Shannon LaFon of the county’s Office of Financial Management told the board that about $6.8 million in surtax revenue would be available in the next two fiscal years — with a borrowing capacity of $11 million over the next five years — Robinson suggested staff delve into the numbers for the next two years, including the borrowing capacity. She also told Gaubatz to take “a big picture look” at the cost estimates for the South County projects.